The Life of I: Czech, Please! I decided to stay in Prague for one more day, and I went with Jussi (Finland) and Michelle & Rochelle (sisters from Edmonton) to Kutna Hora. It's a small town about an hour away by train and was the site of a silver mine and also some cathedral decorated with human bones. We arrived there a little late because of the train scheduling and didn't get much time there because the girls had a flight to catch and all our tickets were on one piece of paper. However, we walked to the bone catherdral and saw it and it was quite intriguing. There was a chandelier made of skulls, tibias, femurs, and other assorted bones, a family crest, and all sorts of weird stuff. Apparently, the graveyard was quite presitigious but had gotten too full, so this was their solution. We were all kind of famished, and so after walking the remaining 2km from the cathedral to the town proper (the train station was a further km away) we grabbed a cheap pizza and a few beers. Time went by rather quickly unfortunately, and our plan to check out the old silver mine had to be dropped. It turned out that it hadn't been used for a hundred years, so I guess I wouldn't have been able to sell them on Startco anyway. Anyone doing this should make sure they have enough time to really visit. Anyway, the girls left for the airport, and Jussi and I took the tram to the river so I could catch some sunset photos. Which I quickly discovered I have little aptitude for. I could either get a silhouette of the Prague castle with the nice sky or the floodlit castle with the sky way over exposed/white. So I have some Photoshop work to do when I get back, I guess. We stood on St. Charles bridge and got a few more pictures and listened to the buskers, and suddenly there were fireworks going off behind us. Yet another place I know nothing about photography. I selected the largest apeture so I could get a quick shutter time, but I wonder now if this is backwards. I was tempted to ask some of the more expert looking photographers on the bridge. Alcatraz. The place lives up to its name. Graffiti all over the place, completely bereft of human life (at time of arrival), communal showers that are semi-private at best, and so on. But cheap. And it's not really that bad (yet) but we like to make jokes about how it really is appropriately named. Especially when we discovered the reason the hostels are all booked is a big gay pride parade is on this weekend, as told to us by the gay front desk clerk (not that there's anything wrong with that). Anyway, we quickly fled the hostel and checked out Alexander Plaza. Berlin is a strange city, sometimes beautiful, other times very much Soviet still. You'll be walking through a sketchy looking area where the buildings are pretty much slabs and there are still holes in the wall from some gunfight in WW2 and encounter this beautiful little park with tonnes of people hanging around enjoying the evening. Or a fake beach bar on the river that I'm trying to think of a way to develop back home. And then into a zone of heavy construction. And back to some nice church. Strange. So I'm not sure what to think, but hopefully tomorrow will tell. I'm probably going to take a Fat Tire Bike Tour because I've heard really good things about them in other cities and I kind of want to go biking again anyway. Berlin seems a good place for it. Maybe it's not a good idea, because I can't seem to keep enough water in my system with all this walking and warm weather. 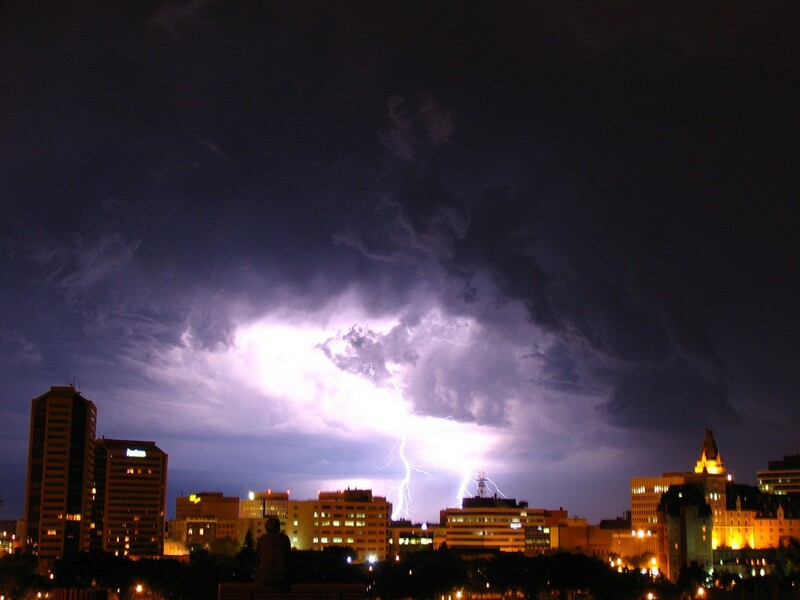 Speaking of which, apparently Saskatoon is having some really crazy weather and Dan sent me photos of this awesome looking thunderstorm over downtown (save to your computer or view in new window to see full-size image). Sounds like the water levels are really high too, amazing how fast that turned around from two years ago. But, I should go and lock myself in before the guards catch me. I'll write again from here if I can otherwise from Copenhagen. Dean give me your web software info. This is Joaquin aka the spaniard.